I went to see the National Guard recruiter today. It looks like it may be a good opportunity. It's something I'll have to think about a little longer. They advertise a minimmum $8,000 bonus on the internet. Unfortunately they have ran out of bonus money and stopped offering bonuses a few months ago. The National Guard Armory is a huge building ... big enough to have Ringling Bros. Circus in last weekend. During my tour I noticed the basement still smelt like elephant crap. After the recruiter I went downtown to get some work done before my class started. All the chairs in that classroom look comfortable, looks are deciving. They are the most uncomfortable chairs in the school. 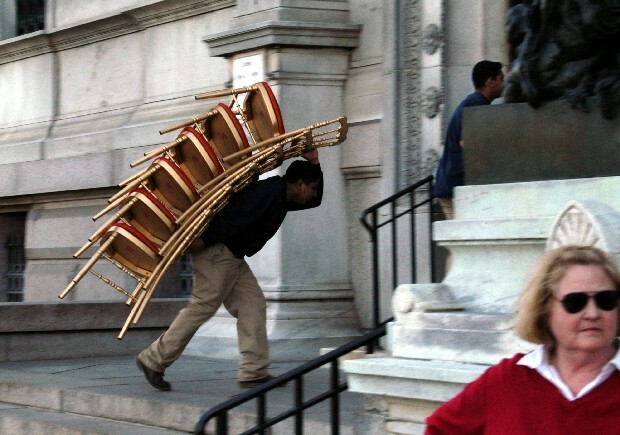 I should have grabbed a chair off of the caterer going up the Corcoran Gallery's front steps.